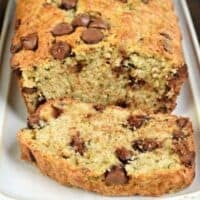 A slice of this freezer friendly Chocolate Chip Zucchini Bread and a cup of coffee is the perfect way to start your day. 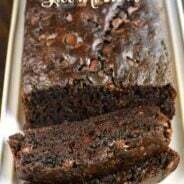 Recipe makes two loaves of sweet bread! So this was a rough weekend for our family. We dropped our oldest daughter off to college, 4 1/2 hours away. I know, I know…this is what we strive for as parents, to raise kids who can fly on their own. I just wish her flight pattern was in town, LOL. But seriously, between sending our oldest son off to the Marines two years ago, and now her to college, I am feeling lost. My husband and I still have our two youngest girls at home, but the dynamics of a family changes with each child leaving the nest. So…we did what any family would do when a child leaves for college. We rearranged all the bedrooms, haha. My middle daughter moved into her sisters room within HOURS of being home. Now the next step if figuring out how to cook for 4 people. Our daughter in college is our swimmer and can eat for 3 people, so cooking for our family was always a big affair…now I have to scale that down. One thing I won’t scale down though is all my bread recipes. If I’m going through the process of baking bread, I like to make TWO loaves, one of for now and one for the freezer. 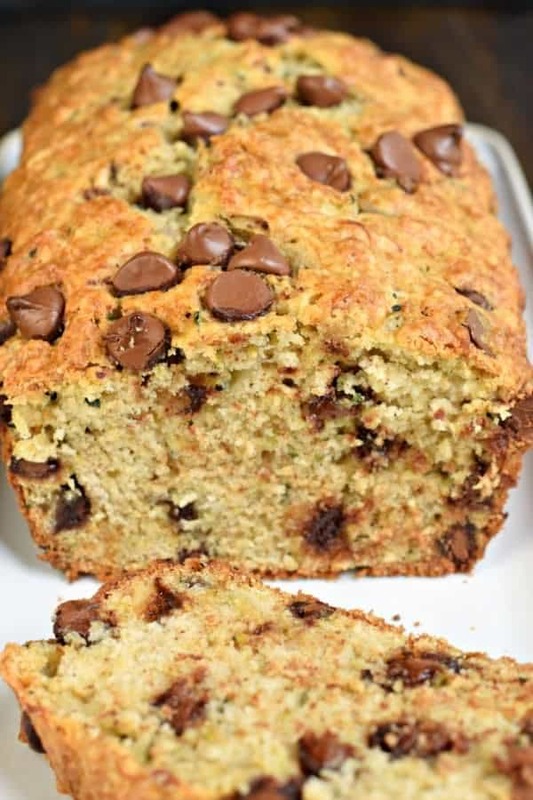 This Chocolate Chip Zucchini Bread is a great way to use up those last of the season zucchini. I prefer to freeze my baked goods instead of freezing the shredded zucchini. I find shredded zucchini thawed is so watery and you lose so much in the process. Plus, it’s great to be able to take a loaf of bread out of the freezer at night and enjoy it for breakfast! With a cup of coffee. 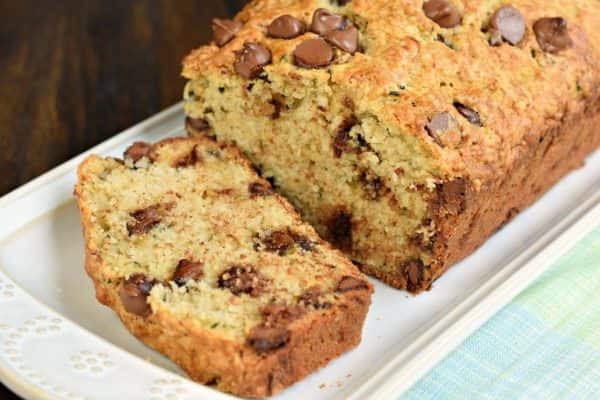 A slice of this Chocolate Chip Zucchini Bread and a cup of coffee is the perfect way to start your day. 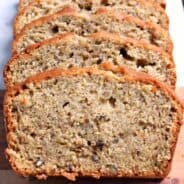 Recipe makes two, freezer friendly loaves of bread! Store wrapped in foil, or freeze for future use! ENJOY! I have so many zucchinis in my garden, ready for picking. I know what I’m doing this weekend. 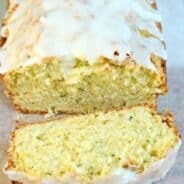 Zucchini bread for all my friends! Love the idea of making an extra loaf to put in the freezer. 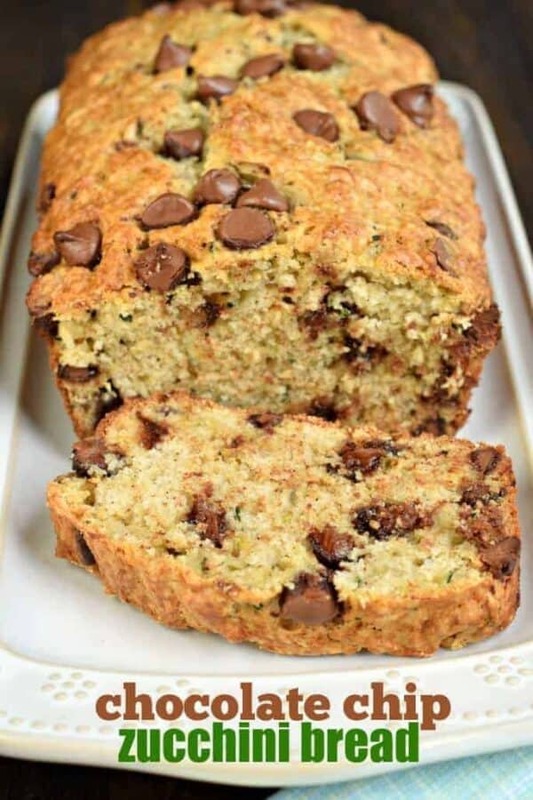 I made this chocolate chip zucchini bread today following the recipe exactly as written. It turned out delicious. Will be added to my list of favorites. So happy to use my extra zucchini in such a yummy way!